This simple tool is more powerful than it looks. The colors we choose have a huge impact on our map: How it is perceived, how well our statement is communicated and how honest we present the data. The following article explains how to use the color palette and what the different options mean for our map design. This article won't explain the "Stops" menu. If you want to understand what stops mean and when to use which kind of stops, please visit the article "How to choose stops for choropleth maps". The first thing we'll see in the color palette tool is the option to choose other color palettes than the one that is selected by default. We can choose between four sequential color palettes (at the top) and three diverging color palettes (at the bottom). Sequential color palettes are great when our numbers go from low to high, like unemployment data, life expectancy or birth dates. These palettes often have bright colors on one side and dark colors or a completely different color on the other side of the scale. Often, bright colors represent the low values while dark colors represent the high values. Diverging color palettes can be used when both extremes and the middle point of our scale are interesting for our map. We can use it for social studies or show how our regions compare to an average value (e.g. "Countries that are more and less religious than the world average"). We can also use it for elections, especially in two-party-countries like the US: Each side of the palette can represent one party. We can create our own color palette by changing the colors of the color markers. To do so, we click on the color markers. A little color picker will appear that lets us choose a new color. If we want to add color markers, we simply click on some free space right below the color bar, next to the color markers that already exist. The new color marker will automatically take the color of the color palette where you place the marker. Meaning, your map won't change if you just add new color markers (and don't drag them or change their color). We can drag the color markers around to change with which color values are shown on our map. In the example below, values between 0% and 50% are represented with colors from light green to turquoise, while values between 50% and 100% are represented with colors from turquoise to dark blue. Once we drag the color markers around, we change that. Now all values between 0% and approx. 70% are shown in the light green, and all the colors between medium green over turquoise to dark blue are reserved for the very high percentages. Instead of moving the color markers, we can drag the number markers to get the same effect. We need to drag the number markers at the triangles; dragging the numbers itself won't work. Like color markers, we can also add and delete number markers. And like adding color markers, adding number markers won't change the colors of our map until we move them around or delete. The number of the new marker will take the value that the color of the color bar represents where we place it. if we want to try out new colors but still want to keep the old colors in case we want to go back to them. if we want to import color palettes from other tools, like from the Chroma JS Color Scale Helper, ColorBrewer or from this Carto site. 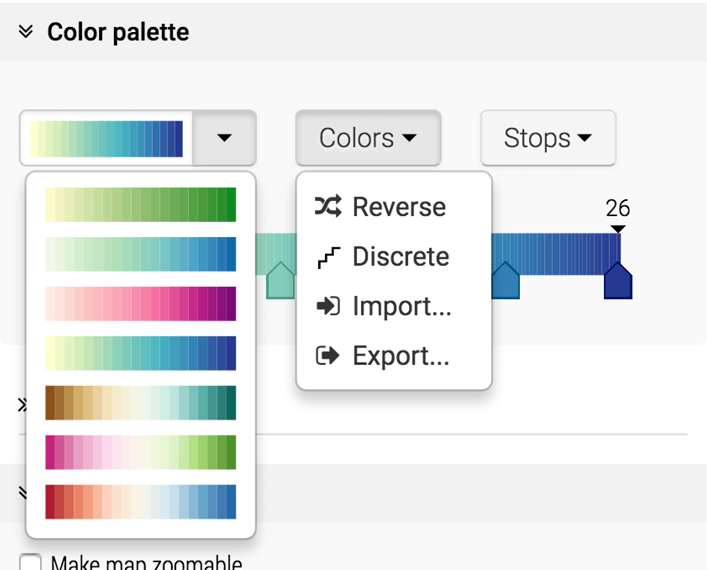 To use this feature, we can click on Colors and then Import to paste a list of hex codes, or Export to copy the hex codes that our color palette uses right now. In case the scale is "the wrong way round", we can reverse the color scale. That's especially useful for diverging maps: e.g. if we want to show low values with the red color of the US-Republicans and the high values with a Democratic-blue. Since Datawrapper doesn't know that, our colors might be exactly reversed when we choose the red-blue color palette. A click on "Colors" and then "Reverse" will help. By default, the color is shown as a gradient. A click on "Colors" and then "Discrete" changes that, and similar values are shown on the map with the same color. The number of color bins is determined by the number of stops. E.g., if we have three stops (min/median/max), our color palette will be divided into two discrete color bins. If we have five stops, there will be four color bins, etc. We can undo the discrete color palette by choosing a new color palette from the menu or by importing a list of hex codes. Next to the "Colors" menu, we find a "Stops" menu that we didn't explain in this article. If you want to understand stops and when to use which one, please visit the article "How to choose stops for choropleth maps".